TELLURIDE, Colo. - Pete Dahle turns suddenly from a popular hiking trail and lopes uphill through a grove of aspen trees. After 50 yards, he slows and begins picking his way through aspens. Friends call Dahle, 31, "Cavey Pete" because he once spent a year living in a cave. He has illegally lived on public land near this resort town for 10 of the last 13 years. His home? A hidden cabin on Forest Service land. He's not alone. 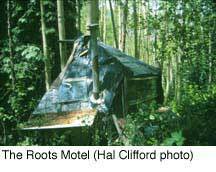 Some 250 "woodsies' may live in tents, under tarps or in cabins. Squatting on public land is common around Colorado's booming mountain resorts, where housing is scarce and almost universally expensive. Residents and officials of Telluride, where workers are needed to run resort businesses, are divided over whether squatting is a problem or an asset. Forest Service rangers say squatting is illegal, but admit they have little time or manpower to police the woods effectively. A steep, 15-minute climb leads to the 8-by-12-foot cabin Dahle built in the early 1990s. A friend of his lives here now, since Dahle found a room for $300 a month in one of Telluride's few remaining ski-bum houses. The tidy cabin sits on a small land bench with a glimpsing view of Telluride's expensive homes below. Constructed of scrap lumber and a sheet metal roof, the cabin has four glass windows with plywood shutters, a lockable door on which a sticker declares "Free Our Public Lands," and a double bed built into its interior. A small woodstove nestles in a brick-lined alcove; a gas cookstove is fed by a 30-pound propane tank. A privy has been constructed of logs, and a new hammock is strung between two aspen trees. "I wouldn't be surprised if I'm back living in the woods in the next year or two," says Dahle. He tidies up around the cabin, proud of the building he constructed by stealth, hauling materials up at night. Several hundred yards below, a structure known to local woodsies as "The Roots Motel" is less organized. About 13 years old, it is a rough pyramid of lumber covered in layers of canvas and plastic, some of them rotting. A fat candle sits on a stump beside the low door. Several bags of garbage rest outside a glass window. The ground around it is packed hard. During the late 1980s, when a major redevelopment boom hit Telluride, many ski bums and local workers who had been living on the cheap in the town's old mining cabins found themselves pushed into the woods. Among them was Lance McDonald, who was working for town hall as a planning intern. "At the time, it was a necessity," says McDonald, who went on to become a town planner. The number of squatters in Telluride's woods increased sharply. By the early 1990s, so many resort workers were living in their cars that the town council opened up a downtown park for winter camping. Since then, Telluride has built a large affordable-housing complex, and, by most estimates, the number of woodsies has dropped. But an observant hiker will still see many small trails snaking into the woods near Telluride, and a stroll cross-country is almost certain to reveal a camp. Not everybody goes along with the loose social compact squatters have with town residents. "It's not acceptable," says Garry Edson, Norwood District Ranger on the Uncompahgre National Forest, which surrounds Telluride. "Long-term residence on the forest is trespass. Some people would say this isn't bad, but these are permanent structures. There's resource damage. There's leveling of the ground, terracing, people import materials into the forest, and there's lots of trash. It's not no-trace camping. And where are these people going to the bathroom? A lot of those tributary streams lead to water sources." Edson adds, "It's not off our list of things to focus on, it's just not on our top 10 at the time." Edson's job is not made easier by divisions among Telluride's public officials. "Until there are severe problems, I don't want to take it away as a lifestyle option," says Mayor Amy Levek. "There's always been a group of people here - in fact, a lot of them are good friends of mine - who've been more comfortable with that lifestyle. I have no problem with it." Jerry Greene, a member of the Town of Telluride Open Space Commission, wants squatters booted. "I do not believe that you should have the right to use the U.S. forest as your permanent residence," says Greene, who owns a local bakery and narrowly lost a re-election campaign to Telluride's town council last November - a loss he blames in part on his stand against squatting. "This is about an urban area that has a forest for its immediate boundaries, and how the forest should be used," he says. Currently, people may legally camp on Forest Service land surrounding Telluride for seven days in one month. If a Forest Service employee finds a camp, he or she must return a week later to determine if the camp is still occupied before writing a $50 ticket and asking campers to move. Greene wants public lands around Telluride - roughly within a one-hour hike - closed to all camping. "It's a conflict of uses," Greene says. "Day hiking is in conflict with camping." District Ranger Edson is studying that idea. People who camp long-term "develop a sense of ownership" for a piece of land that belongs to everyone, he says, noting some squatters tie dogs near trails that can intimidate day-users. "They prevent someone else from using public land." Although Telluride appears to have the largest group of squatters, Al Grimshaw, with the Aspen Ranger District of the White River National Forest, says, "I've seen evidence of that having occurred along the south edge of Aspen. "But I think we've got so many wealthy people living on high-priced land, they don't want somebody living in a tepee on forest land, and we'd hear about any trespass pretty quick." Near Crested Butte, Colo., squatting is an annual summer phenomenon, says Craig Magwire, recreation forester on the Gunnison National Forest. He and his colleagues patrol, but "not nearly as much as we need to. We have a lot of people camping - clearly residing - and it definitely changes the character of the backcountry. It feels different; not the recreation setting we would hope to provide." But Magwire and Greene think the Forest Service should look into providing long-term campgrounds for resort workers. "I think we're only limited by our creativity," says Magwire. "Ultimately, the solution to this problem is to find a more appropriate place for employees to reside as they work," he says. "Rather than us being in enforcement mode, the best solution is to find appropriate housing for folks." But Edson doesn't expect it to happen. "Honestly and frankly, it's not in the Forest Service's mission to provide low-cost housing." Hal Clifford is a frequent contributor to High Country News and the paper's syndicate, Writers on the Range, from Telluride, Colorado. Amy Levek, Telluride mayor, 970/728-6168.